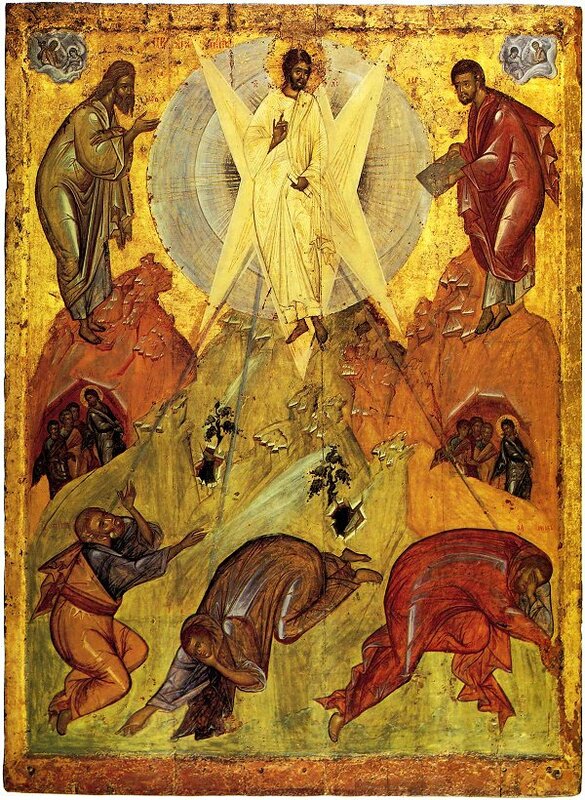 The Transfiguration of the Savior occupies a central position in the Orthodox Church and theology. It is the event that reveals the glory of the Church and of the faithful. It is the evidence of the new situation that entered history through the advent of Christ. At the Transfiguration, Christ manifested through His human nature the uncreated glory of His Divinity. At the same time, He caught up the men with Him in the uncreated divine glory. With the Transfiguration, Christ confirms, on the one hand, His divinity, which His disciples had confessed a little earlier, through the mouth of Saint Peter, and, on the other, offers the first evidence of the coming of His kingdom. Celebrating the Transfiguration on August 6 perhaps doesn’t help us to remember the direct connection with the Cross of Christ. Only if we recall that, a few weeks later, on September 14, we keep the feast of the Universal Elevation of the Honorable Cross, which reminds us of Great Friday, do we find the historical link with the feast. As a historical event, then, the Transfiguration occurred a few weeks before the Passion. In the calendar of feasts of the Church, it would normally have its place a few weeks before Easter, perhaps as many as now separate it from the Elevation of the Honorable Cross. And it should not be thought coincidental that, in that place, the Church has chosen to put another feast: that of the theologian of the Light of Tabor, Saint Gregory Palamas. Thus the second Sunday of Great Lent, five weeks before Easter, is dedicated to Saint Gregory Palamas. It is also characteristic that, in the three synoptic Gospels, the Transfiguration (Mark 9:2-8) occurs immediately after a declaration by Christ that “there are some standing here who will not taste death until they see the kingdom of God coming in power” (Mark 9:1). Thus, the Transfiguration of Christ, as Patristic Tradition also notes, is a “potential” manifestation of the Kingdom of God. [There is a translation problem here. Sometimes the early translators of the Bible (who often “cribbed” from the Latin rather than translating the Greek) were not aware of Greek idioms and translated literally. It is true that “ἐν δυνάμει” means “in power”, but it is used to mean “nascent, bourgeoning, foretaste”. Given the juxtaposition of Christ’s saying with the event of the Transfiguration, it is clear that, as the Fathers interpret it, the Transfiguration is an “inkling” of the kingdom of heaven. This would have been obvious if the Latin version (the Vulgate) had had “in potentia” instead of “in virtute”]. The light of the Transfiguration is the Uncreated Light of the Kingdom of Heaven, which entered the world with the advent of Christ. Of course, the Kingdom of Heaven, being without beginning or end, is not confined in time but overarches it and transfigures it. It doesn’t begin with the end of history, but is already present in it and above it and will continue to exist beyond it. In reality, then, this “coming” advent of the Kingdom of God is nothing more than the manifestation of its “potential”. It’s not that something is coming which didn’t exist before, but that something is revealed which already existed and will always exist. Just as the Uncreated Light which was revealed to the disciples at the Transfiguration existed from the beginning and remains eternally in the theanthropic hypostasis of Christ, so the Kingdom of Heaven, which came into the world with Christ, is manifested to the faithful, sometimes, as an inkling of the age to come. People acquire the sense of Christ’s adoption in their lives by keeping the divine commandments. By self-negation and self-offering to God and His will, both of which are a form of death, a believer becomes a partaker of the divine Life and Kingdom. The foretaste of eternity doesn’t begin after the Cross, but with the Cross. Obedience to the will of God “unto death” is already participation in the resurrection. Just as the glory of Christ begins with the Cross, which puts to flight the forces of the Evil One, so the glory of Christians begins with the voluntary acceptance of death for Christ, which vanquishes the old person and reveals the new. The Transfiguration of Christ is the preparation for the Cross. And the Cross of Christ is the starting-point of His glory as a person. With His Transfiguration, Christ didn’t acquire anything new, but gave his disciples strength before His Crucifixion. The disciples needed to be strengthened so that they could come to terms with the Crucifixion of their Teacher, and with their own cross which they bore later in the name of their Teacher. The gateway to the Kingdom of God is the Cross. And the glory of God in the world begins with the Cross. Every manifestation of the glory of God in history, before or after the advent of Christ, is a foretaste or extension of the Cross of Christ. Every experience of the glory of God in this present life heralds or accompanies the Mystery of the Cross. Source: Ορθόδοξη Μαρτυρία, Cyprus, no. 49, Spring-Summer 1996, pp. 1-8.